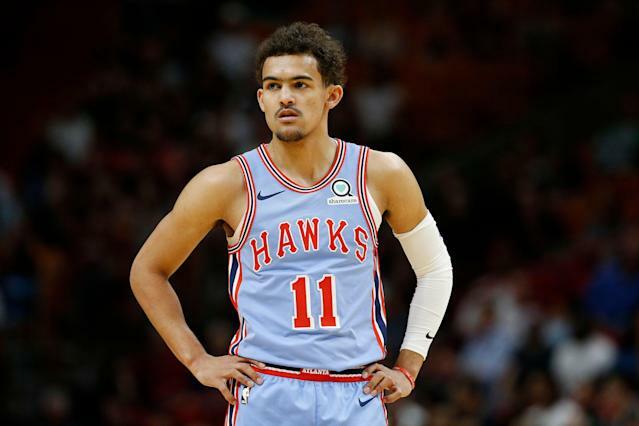 ATLANTA — Trae Young has consistently acknowledged what a spectacular year his fellow rookie classmate Luka Doncic is having with the Dallas Mavericks. But the Atlanta Hawks’ point guard made it clear on Yahoo Sports’ NBA podcast Posted Up with Chris Haynes that he believes he should be the 2018-19 NBA Rookie of the Year. The podcast, recorded at Young’s penthouse suite in a suburb of Atlanta, includes a discussion of his rivalry with Doncic — for whom he was traded, Atlanta’s nightlife that can get the best of opponents on game nights, why he wasn’t in the NBA 3-Point Contest, and what it was like growing up with a father, Rayford Young, who starred at Texas Tech and played basketball professionally overseas. For most of the season, Doncic has been the ROY frontrunner because of his steady play throughout the season. The 20-year-old from Slovenia is averaging 21.1 points, 7.5 rebounds and 5.8 assists in 65 games. Young, 20, has seen his statistics rise each month and is now averaging 18.4 points, 3.6 rebounds and 7.7 assists. The pair has won every Rookie of the Month honor with the exception of New York Knicks wing Kevin Knox nabbing December’s award in the Eastern Conference. Young is the only rookie to have started and played every game this season, and with 10 contests remaining for the Hawks, the 6-foot-2 guard believes there is still enough time to sway voters his way.